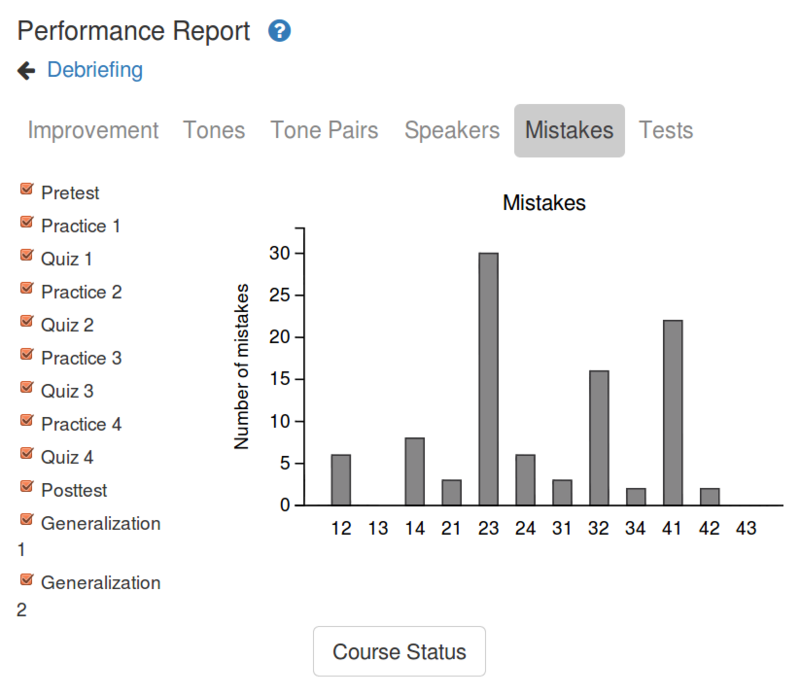 Part of a breakdown of a student’s bottom-up listening ability. Listening should come before speaking. I think this is true for language learning in general, but it is particularly true for pronunciation. It is of course necessary to be able to distinguish and identify sounds to understand spoken language, but it’s also true that it’s much harder (nigh impossible) to reliably and correctly pronounce sounds that you can’t hear. In this article, I will show you ways to train and test your ability to distinguish basic sounds in Mandarin. The most important step for all new students is to learn the sounds of Mandarin. This is often dealt with in the first week(s) of a course and is then largely forgotten or not focused on. People who are able to pick up the new sounds in that time can then gradually improve, but students who struggle never get the support they need and are often left behind. Not paying attention to sounds (listening and speaking) early on is very bad and will come back to haunt anyone who does it. When teaching pronunciation to beginners, listening is often glossed over or even ignored completely. That is to say, it’s common to teach how something is pronounced without first training or testing students’ ability to hear that sound. This is frustrating for students and makes it very unlikely that the majority of them will actually get it right. There are two different approaches you can take here. The first involves focusing on small units, such as individual initials, finals, tones and syllables. The other involves longer chunks, such as phrases and sentences. In other words, you can use a bottom-up or a top-down approach. There’s no good reason to use only one of them, though, so I suggest you use both. This article will be mostly about bottom-up testing and training, but I will return to the top-down alternative towards the end. An easy way to either test or train your ability to hear initials, finals and tones is to simply generate a random list of recorded syllables and try to transcribe what you hear when you play the list. For example, if you’re struggling with the difference between Pinyin j and q, or the difference between c and ch, you can just select a bunch of recorded versions of syllables containing these initials, throw them into the media player of your choice, create a random list and press play. The most obvious use for this method is to test how well you can hear the sounds. If you’re able to accurately write down what you hear, you can be reasonably sure that listening on this level is not a problem. This means that if you still have pronunciation issues, you have at least eliminated this as a potential source. 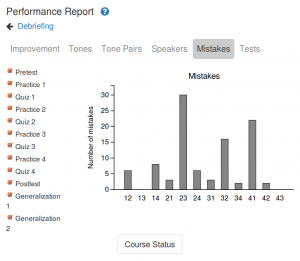 It doesn’t mean that you’re done with listening practice, of course, because listening is about a lot more than bottom-up processing. If you know of more resources like this, do let me know, because variety is important here. Both recordings are done by female speakers, and ideally, we would like to include male speakers as well, preferably more than one! I don’t know what media player you use or how it works, so I can’t offer any technical advice, but most players should be able to generate a random list of “songs” and play it to you. It’s essential that you can see the list afterwards to check if you’re right. A workaround if this is not possible is to hit the back button, which usually goes though the randomised list backwards. Limit the total number of syllables you use; start with a really low number like four and then work your way up if that feels okay. Limit the number of different syllables, especially when you practise (rather than test), so focus on the difference between j and q, or the difference between c and ch, for example. Limit what you listen for! It’s perfectly okay to just ignore tones and focus on initials. Or ignore initials and finals and only write down tones. Limit as much as you need. Check the right answer by looking at the name of the sound file you just played. Do this immediately after writing down what you think you heard. This gives you quick feedback and writing it down stops you from cheating. Try to find patterns, i.e. sounds you always mistake for other sounds, then focus on that pair for a bit. Reading about those sounds can also help sometimes. Compare a lot. Variation is important, so make sure you don’t stick to the same syllables with c and ch, and if you focus on tones, don’t use the same syllables all the time. If basic tones is your main problem, I suggest you try the tone training course I’ve created together with Kevin at WordSwing. It systematically exposes you to tones by different speakers to increase your ability to correctly identify them. The course currently only covers single syllables, but that’s still a good start. 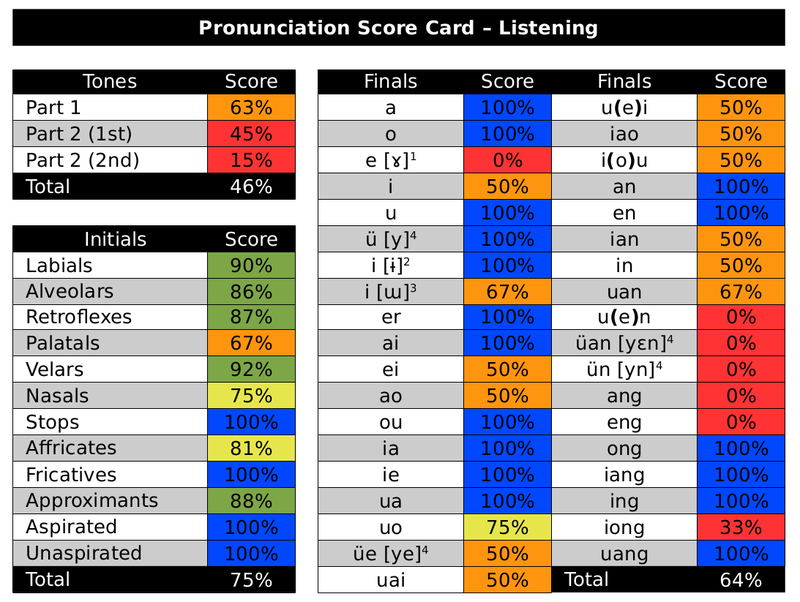 The next step would be to focus on tone pairs instead, which I’ve written an article about too: Focusing on tone pairs to improve your Mandarin pronunciation. Finally, before we round this off, let’s talk about top-down listening. Real-world listening comprehension is much more complex than being able to distinguish sounds. It’s about understanding context, vocabulary, grammar, culture and so on. Furthermore, sounds influence each other a lot too, so being able to distinguish them when heard in isolation is not the same as doing it in context. There is no quick fix for this, though, you simply need to listen a lot. As a beginner, you won’t benefit much from just listening a lot to native speakers talk, because it will be mostly gibberish to you. One way to access some of the benefits from top-down listening as a beginner is to focus on a small number of sentences and really study them closely. This helps you get at things such as sound changes (especially tones), intonation and many other things that are lost in the bottom-up approach described above. Good luck!